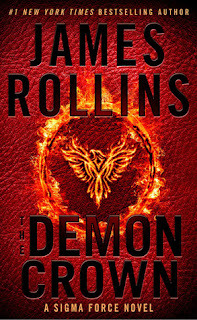 The Demon Crown by James Rollins is a very highly recommended terrifying, horrifying thrill ride of action and adventure! This is a smart, excellent new addition to the Sigma Force series. Professor Ken Matsui, an entomologist who specializes in venomous creatures, is the lone survivor of an attack on an island off the coast of Brazil. What he discovers there is a frightening foe that hasn't been seen alive for millions of years. Surprisingly, the threat was first known by James Smithson, the man who founded the Smithsonian Institution. A secret vault under the National Mall holds the artifact first collected by Smithson and buried with him. Alexander Graham Bell led a team to recover the artifact and hide it to protect humankind. The artifact is the bones of a small dinosaur preserved in amber - Smithson called it the Demon Crown. They cannot destroy it as it is said to hold the very secret of life after death. Additionally, Smithson’s diary contains the warning that "what the Demon Crown holds is very much alive... and ready to unleash the very hordes of Hell upon this world." When the large chunk of amber is stolen, the secret it contains is unleashed as a dreadful, horrifying weapon with an unimaginable strength to wipe out life as we know it. When the menace is unleashed on the islands of Hawaii, the Sigma Force must survive it and try to stop the maniac behind the abominable attack before the threat expands to cover the Earth. The Demon Crown is one of the stronger additions to the Sigma Force novels and it will hold your attention in a vise-like grip for the whole novel. The novel presents us with a terrifying, repellent, menacing horde. Rollin's cautions in the opening Notes From the Scientific Record that we are living in the Age of Insects and "some insect will kill one person out of sixty every year." It could be possible that insects contributed to the extinction of the dinosaurs. Unless you want to be scared half to death, those with spheksophobia, apiphobia, or melissophobia need to be warned to avoid this book. As expected, the writing is excellent, the plot intelligent, and the action is non-stop and fast-paced. This would be the perfect selection for reading during a vacation when staying up late reading "just-one-more-chapter" might not matter as much - because you will lose sleep when reading The Demon Crown. All the team members are back for long time fans of the series. There is also an unexpected alliance that must form to save the world. There are chapters written from the view of the menacing foe that are truly frightening. As many of us who are fans of Rollins expect, at the end of the novel there is a whole section on Truth or Fiction. I love that Rollins includes these notes and I appreciate the work and research he does when writing his novels. 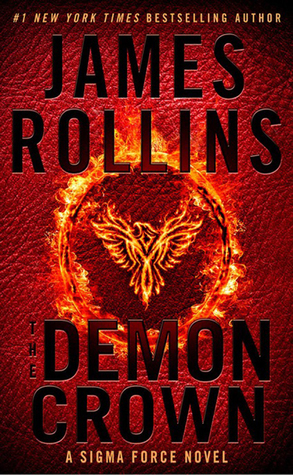 I know many of us like the fact that Rollins treats his readers with respect and a nod to their intelligence and ability to comprehend a complex plot based on facts and science.